Text: But as I was saying – for I hate prolixity – as I was saying above Mr. Ireland (in imitation of the odd soul I have laboured to describe) – came in person twice) wishing to do me honor as well as pleasure – came in person twice, to insist accompanying he and she and two more, to see Mr. Henderson take possession of the throne of Richard – into the boxes – (I believe box is properer) – We went – the house as full, just as it could be, and no fuller – as hot as it was possible to bear – or rather hotter. – Now do you really and truly conceive what I mean? – Alas, there are some stupid souls, formed of such phlegmatic, adverse materials, that you might sooner strike conception into a flannel petticoat – or out of one – (now keep your temper, I beg, sweet Sir) than convince their simple craniums that six and seven make thirteen. It was a daring undertaking – and Henderson was really awed with the idea of the great man, whose very robes he was to wear – and whose throne he was to usurp. – But to give him his due – he acquitted himself well – tolerably well – He will play it much better next time – and the next better still. Rome was not built in six weeks – and, trust me, a Garrick will not be formed under seven years. – I supped with his Majesty and Mr. and Mrs. Ireland, where good-nature and good-sense mixed itself with the most cheerful welcome. Comments: Ignatius Sancho (c.1729-1780) was a black British author and composer, whose posthumously-published letters gained a wide readership. John Henderson (1747-1785) was an actor whose rivalry with David Garrick is the source of Sancho’s satirical humour (Garrick had retired from acting in 1776). He first appeared in the title role of Richard III at Drury Lane on 7 October 1777. There was a production of the play at Drury Lane in September 1779, but it did not feature Henderson. I cannot explain the discrepancy over dates. John Meheux was an artist friend of Sancho’s. Text: Dear Louisa’s birthday. God bless & protect her! — Very cold, but fine. — Out with Vicky & Beatrice. — Louisa only arrived very ill & having a heavy cold. — Drove with Ismay S. & Ina McNeill. — Poor Louise had to go to bed, too annoying just today. — Bertie arrived; he & Lorne dined with us 4, & afterwards Tennyson’s play “Thomas A. Becket” was performed in the Waterloo Gallery. Everything was arranged as at the previous performances. The play of Becket, almost a tragedy, lately produced at the Lyceum, is very fine & was written by Tennyson 9 years ago. It has 4 acts with a Prologue, but the whole was somewhat curtailed. The staging is magnificent & Irving had all the scenery, (there were many scenes) painted on purpose. The dresses & every detail were so correct & exact. Irving acted well & with much dignity, but his enunciation is not very distinct, especially when he gets excited. Ellen Terry as “Rosamund” was perfect, so graceful & full of feeling & so young looking in her lovely light dress, — quite wonderfully so, for she is 46.!! A son of hers takes the part of a young Templar in the splendid Parliament scene. The “Bower” in the wood was lovely & so was the other wood scene in which takes place the dreadful meeting between that horrid wicked Queen Eleanor (very well acted by Miss G. Ward) & Rosamund. It is a most terrible scene well. Mr Terris, though he acted well, I thought too noisy & violent as the passionate King Henry IInd. The last scene, when Becket refuses to fly & defies his murderers, is very fine, & his death, & the way he falls down the steps, very striking. The language is very beautiful, & so is the incidental music, expressly composed by Stanford. The performance was over by 12, & we (excepting Vicky, who was much interested) went to the Drawing Room, all the visitors passing by, after which Irving & Ellen came in. I spoke to them & told them how pleased I was. She is very tall, pleasing & ladylike. Comments: Alexandrina Victoria (1819-1901), later just Victoria, was Queen of the United Kingdom of Great Britain and Ireland from 1837 to her death, and additionally titled Empress of India from 1876. She kept up a journal from 1832 until almost the end of her life. The journal records many visits to the theatre, particularly in her younger days. This entry records a private performance of Tennyson‘s Becket at the Waterloo Gallery in Windsor Castle. The play had been running at the Lyceum Theatre, London. Text: It is difficult to realise that before leaving France I saw Hamlet performed by soldiers of the British Expeditionary Force within a few hours’ distance of the firing line. An officer of high standing who saw the play hit off the situation: “Our men do not live by bully beef alone; they need some food for the mind, and there is nothing better for them than the great thoughts of our great writers.” The play was performed in costume, with scenery painted in camp, and with not a word misplaced or forgotten in the rendering. Four scenes were chosen – the Ghost scene; the room in the castle where Hamlet decides on revenge; the great soliloquy and the graveyard. The cast was chosen on the spot, neighbouring towns and libraries were scoured for copies of the play, as there was no time to send to England. Luck turned our way, copies were secured, and in a town close by was a branch of a Paris theatrical costumier. Horatio looked more like Henry VIII on the Field of Gold than the friend of Hamlet; while Hamlet’s costume reminded one more of Madame Tussaud’s than of Sir J. Forbes-Robertson; but on active service one cannot be particular. The Colonel commanding the base was informed of what was in progress on the Saturday evening; he suggested scenery. Imagine the burst of joy when we discovered a sergeant-major who had been stage carpenter. We went altogether to the Y.M.C.A., where the play was to be performed; there we found two A.S.C. men working at the stage, and preparing footlights. The thrilling moment in the preparations came when two privates of the London Scottish offered to paint the scenery if we could find paint and brushes.The difficulty of bringing together all the equipment left us until Monday morning before we began, and I still wonder if there is anything in military or civil life to approach the calm confidence of these men who were to play Hamlet that night, and at 10 a.m. of the same day were faced with a few boxes of dry paint, some brushes, and several square yards of canvas stretched on tent poles; but they did it, and just before the play began the last scene was carefully slung up, still wet. Long before the time of starting, a great queue assembled. The colonels and officers of the battalions represented honoured the production by their presence; also the matrons and nursing staff of the hospitals, and over a thousand men gained admission. The doors and the windows of the hut were opened so that the crowd outside could hear. Yet during this growing excitement we were shutting out the thought that any one of our company of actors and stage-hands might be called on duty any minute, for most of them were standing by waiting to go to the firing line. The curtains were drawn and, instead of the usual respectful silence that greets the opening of a scene in Hamlet, there were yells of full-throated applause. Or close up the wall with your English dead. Cry God for Harry, England, and St. George! The effect was electrical. Had the bugle sounded the charge every man would have rushed out of that building, as he was. All the latent warrior spirit of our race seemed to leap to a flame. As we went out into the still night our hearts were stronger, our minds brighter, our courage high, and in the quiet stars above brooded the certain promise of victorious and lasting peace. Comments: The unsigned article naturally does not identify the location. J. Forbes Robertson was the most notable Shakespearean actor of the period. Text: June 16th. – (At Dresden.) Took a short walk after dinner, and found that I remembered much of the city, though a great part of it seems new, and not quite so gay as I had fancied it. In one respect we were very lucky. Schlegel’s Shakespeare’s “Twelfth Night,” called Was Ihr wollt, was played, and greatly to our satisfaction. The only mortification was, that I had such a faint recollection of Shakespeare. But Brown, who recollected more, could follow the translation throughout. It seemed to us admirably given. Sir Toby Belch, Sir Andrew Aguecheek, and Malvolio, all seemed to us quite in conformity with the English conception of the characters. A Madame Meyer Bourke played both Viola and Sebastian; and, when personating the latter, she gave a manliness to her voice and step which would have almost deceived us as to her identity. There was, of necessity, a change in the text at last. Another person, who managed to conceal his face, came in as Sebastian. Comments: Henry Crabb Robinson (1775-1867) was an English lawyer and diarist, whose published journals document his acquaintance with literary figures of the period and refer regularly to theatre productions that he saw. This entry records a theatre trip in Dresden as part of a tour of Germany he undertook in the summer of 1851. He saw August Wilhelm Schlegel‘s Was Ihr wollt, an adaptation of Shakespeare’s Twelfth Night, at the Royal Court theatre, Dresden, on 16 June 1851. August Wilhelm Schlegel’s translations of Shakespeare‘s plays greatly helped popularise him in Germany. Text: I went to the Théâtre-Français and saw “Andromaque.” I have no doubt Madame Rachel deserved all the applause she received in Hermione. Her recitation may be perfect, but a Frenchman only can be excited to enthusiasm by such merits. She wants the magical tones, and the marvellous eye, and the majestic figure of Mrs. Siddons. The forte of Rachel, I dare say, is her expression of scorn and indignation. It was in giving vent to these feelings that she drew down thunders of applause. Comments: Henry Crabb Robinson (1775-1867) was an English lawyer and diarist, whose published journals document his acquaintance with literary figures of the period and refer regularly to theatre productions that he saw. He saw Jean Racine‘s Andromaque at the Comédie-Française, Paris, on 13 June 1850. 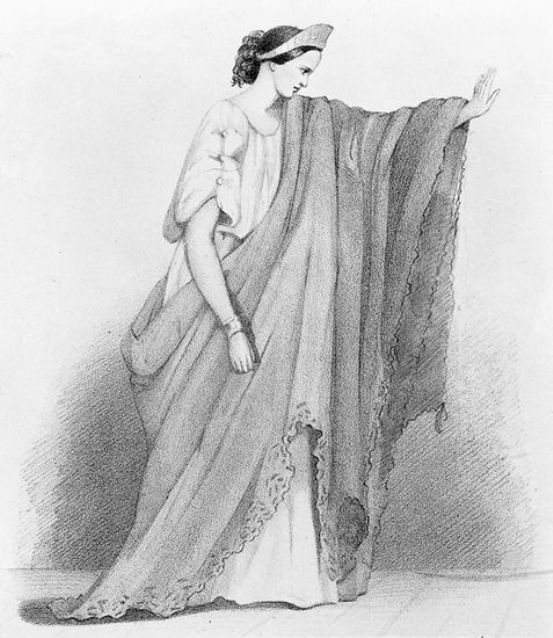 Rachel (Elisa Félix) (1820-1858) was one of the great stars of the Comédie-Française, known especially for her performances in classical roles. She played an important in reviving interest in French tragedy, such as Racine’s Andromaque. Text: One of the most cruel wars in the history of the world had nearly closed. The people of the United States were rejoicing at the prospect of peace and returning happiness. President Lincoln, after the surrender of General Robert E. Lee, visited Richmond, Virginia, exposing himself to great danger, and on his return delivered an address from the balcony of the White House. I was then a Commissioned Officer in the Medical Department of the United States Army, having been appointed from my native State, New York, and was on duty as Surgeon in charge of the Wounded Commissioned Officers’ Ward at the United States Army General Hospital, Armory Square, Washington, District of Columbia, where my professional duties were of the greatest importance and required constant and arduous attention. For a brief relief and a few moments in the fresh air I started one evening for a short walk on Pennsylvania Avenue. There were crowds walking toward the President’s residence. These I followed and arrived just at the commencement of President Lincoln’s last public address to his people. From where I stood I could distinctly hear every word he uttered and I was profoundly impressed with his divine appearance as he stood in the rays of light, which penetrated the windows of the White House. The influence thus produced gave me an intense desire again to behold his face and study the characteristics of the “Savior of his Country.” Therefore on the evening of April 14, 1865, after the completion of my daily hospital duties, I told my Ward Master that I would be absent for a short time. As a very large number from the Army stationed near Washington frequently visited the city, a general order was in force that none should be there without a special pass and all wearing uniform and out at night were subject to frequent challenge. To avoid this inconvenience officers stationed in Washington generally removed all signs of their calling when off duty. I changed to civilian’s dress and hurried to Ford’s Theatre, where I had been told President Lincoln, General Grant, and Members of the Cabinet were to be present to see the play, “Our American Cousin.” I arrived late at the theatre, 8.15 p. m., and requested a seat in the orchestra, whence I could view the occupants of the President’s box, which on looking into the theatre, I saw had been beautifully decorated with American flags in honor of the occasion. As the building was crowded the last place vacant was in the dress circle. I was greatly disappointed, but accepted this seat, which was near the front on the same side and about 40 feet from the President’s box, and soon became interested in the pleasing play. Suddenly there was a cheering welcome, the acting ceased temporarily out of respect to the entering Presidential party. Many in the audience rose to their feet in enthusiasm and vociferously cheered, while looking around. Turning, I saw in the aisle a few feet behind me, President Lincoln, Mrs. Lincoln, Major Rathbone and Miss Harris. Mrs. Lincoln smiled very happily in acknowledgment of the loyal greeting, gracefully curtsied several times and seemed to be overflowing with good cheer and thankfulness. I had the best opportunity to distinctly see the full face of the President, as the light shone directly upon him. After he had walked a few feet he stopped for a moment, looked upon the people he loved and acknowledged their salutations with a solemn bow. His face was perfectly stoical, his deep set eyes gave him a pathetically sad appearance. The audience seemed to be enthusiastically cheerful, but he alone looked peculiarly sorrowful, as he slowly walked with bowed head and drooping shoulders toward the box. I was looking at him as he took his last walk. The memory of that scene has never been effaced. The party was preceded by a special usher, who opened the door of the box, stood to one side, and after all had entered closed the door and took a seat outside, where he could guard the entrance to the box. The play was resumed and my attention was concentrated on the stage until I heard a disturbance at the door of the President’s box. With many others I looked in that direction, and saw a man endeavoring to persuade the reluctant usher to admit him. At last he succeeded in gaining an entrance, after which the door was closed and the usher resumed his place. 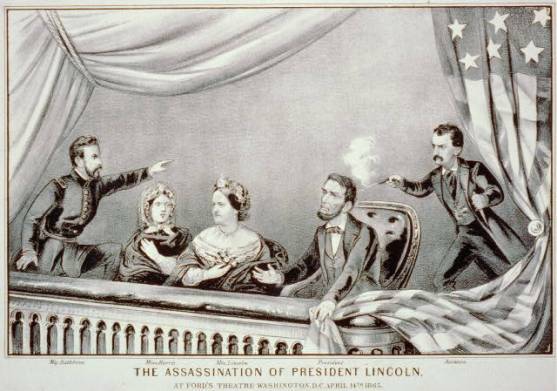 For a few moments all was quiet, and the play again held my attention until, suddenly, the report of a pistol was heard, and a short time after I saw a man in mid-air leaping from the President’s box to the stage, brandishing in his hand a drawn dagger. His spur caught in the American flag festooned in front of the box, causing him to stumble when he struck the stage, and he fell on his hands and knees. He quickly regained the erect posture and hopped across the stage, flourishing his dagger, clearing the stage before him and dragging the foot of the leg, which was subsequently found to be broken, he disappeared behind the scene on the opposite side of the stage. Then followed cries that the President had been murdered, interspersed with cries of “Kill the murderer!” “Shoot him!” etc., from different parts of the building. The lights had been turned down, a general gloom was over all, and the panic-stricken audience were rushing toward the doors for exit and safety. Comments: Charles Augustus Leale (1842-1932) was an American surgeon, who served with the Union army during the American Civil War. He attended to President Abraham Lincoln after he was shot by John Wilkes Booth during a performance of English playwright Tom Taylor‘s three-act comedy Our American Cousin at Ford’s Theatre, Washington in the evening of 14 April 1865. Leale’s attentions meant that Lincoln lived a little longer, dying the following morning.